My four children try weekly to chip away at the “no pets” policy in force in my home. For goodness sake, I have four children. For how many more living things am I to be held responsible? I admit that I allowed a chink in my armor when the fish came home from 1st grade. These free guppies have exhibited true resilience given that my now nine-year-old is responsible for cleaning the water weekly (more like monthly) and given that we tend to forget to make other arrangements when we go out of town. They’re survivors. Still I hold firm: no pets. But what would you do in the following situation? Friday night, I was rearranging the furniture in my living room. (Wow. I just reread that sentence. Please give me a moment.) I glanced at the wall next to Jorge the ficus tree. It was covered with bugs. Fifty bugs? One hundred? Over a hundred bugs on my living room wall? My husband joined me in looking more closely and we realized that our living room had recently seen the delivery of a whole mess of baby praying mantises. They were about a quarter of an inch long and perfectly formed. The triangular head, the long stick body, the praying arms. Sure enough, I rifled through Jorge’s leaves and there it was, an empty praying mantis egg sack. Jorge summers in the garden and passes his winter cozy and warm inside with us. 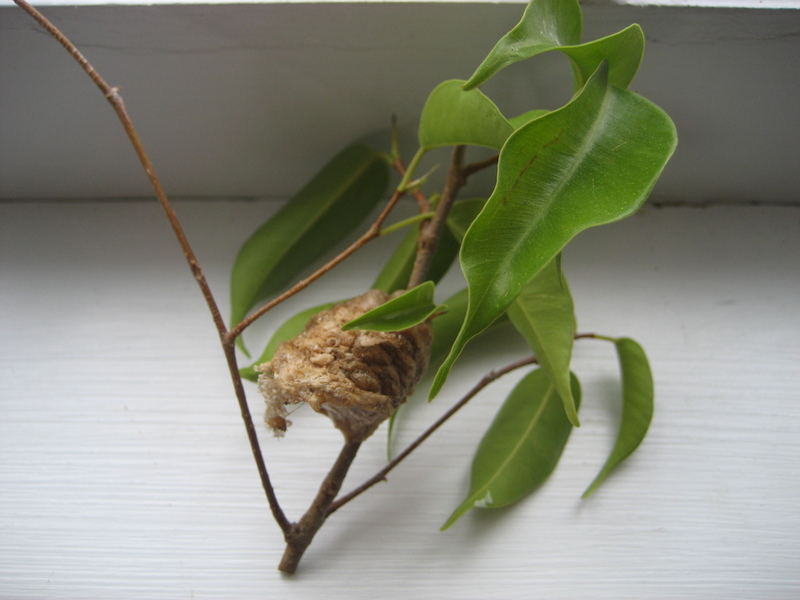 Cozy and warm + praying mantis egg sack = hatched praying mantis egg sack. Instead of incubating through the winter outside as nature intended, our babies were forced to hatch in January instead of May. My husband and I had the same reaction. We can’t kill them, can we? 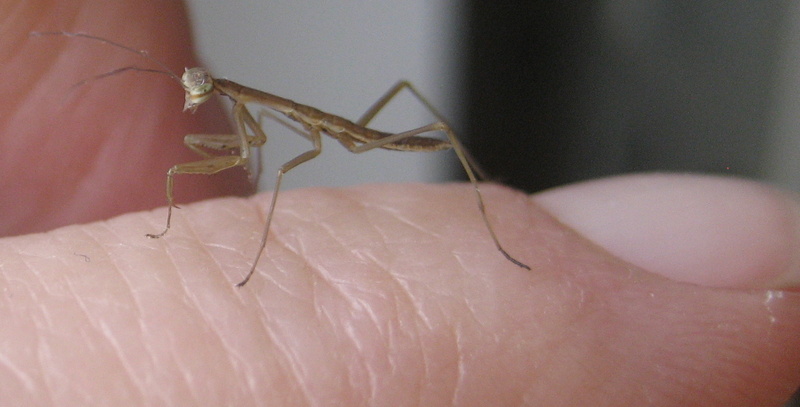 It had been ingrained from both of our childhoods: praying mantises are precious. Let them be. I rejoice to find a full fledged mama chowing down on the insects in my garden. The babies won’t survive outside now, in January. Can we keep them alive for four months until it’s warm enough? We can’t keep all of them, surely, but could we try for a small litter? And so, we two anti-pet activists collected 8 of them and vacuumed up the rest. We put them in a jar with some celery and some ficus leaves. Then we got online to figure out how to keep them. (This all before we called the kids to take a look. Problematic, to be sure). Live bugs is what they need. Aphids, preferably, when they are in the infant stage. Where am I going to get aphids in January? We took the advice of a blogger in our same predicament: we hung raw hamburger meat from a string and encountered no opposition. Reading further, other advice criticized the raw meat approach, pointing out that praying mantises are hunters and must practice their hunting skills if they are ever to survive in the wild. Oh boy, this is getting complicated. Two trips to the pet store and a borrowed 10-gallon tank later, we have 10 (the kids caught two who were in hiding during the vacuum scourge) quickly growing, active miniature mantises. I finally found a meal that appealed. Flightless fruit flies. My four year old and I just spent 30 minutes watching the hunt. 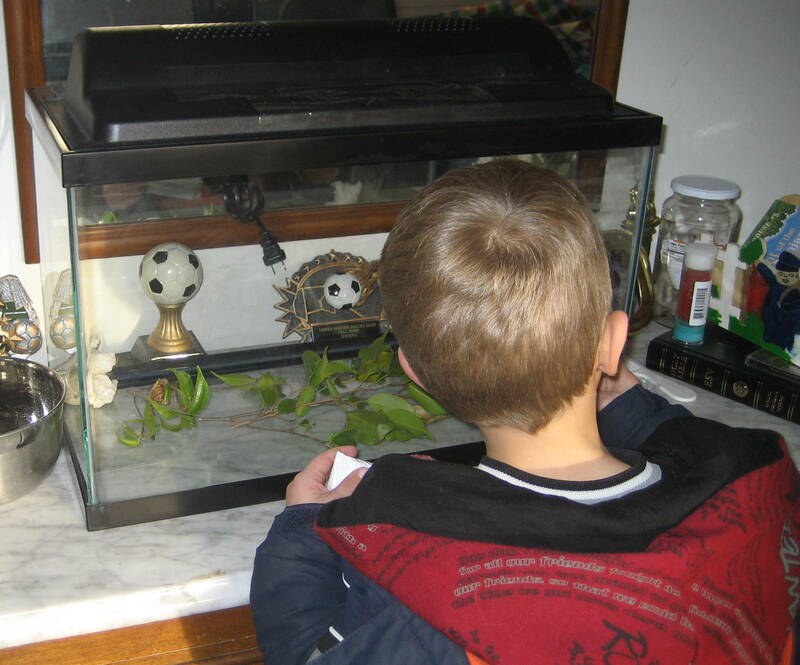 Choosing entomological observation over television – a triumph. I’m afraid we might have to apply a rating system if we get these guys to the mating stage. Decapitation as a necessary part of the act. Brutal. And probably rated R for violence and some sexual content. My friend from Germany says that praying mantis adults are sold as pets there for one hundred euros. I just found them online for the bargain basement price of $10 each. But even at that rate, the praying mantises in my tank are worth $100. And the ones in my vacuum bag?? A grand, easy. Today, I got to work in my garden. Ahhhhhhhh. And as I was puttering and watering and weeding, I realized that in the midst of my craziness, the garden has given me things to smile about. It continues to work, even when I can’t. So here are the ways my garden made me happy this week. 1. 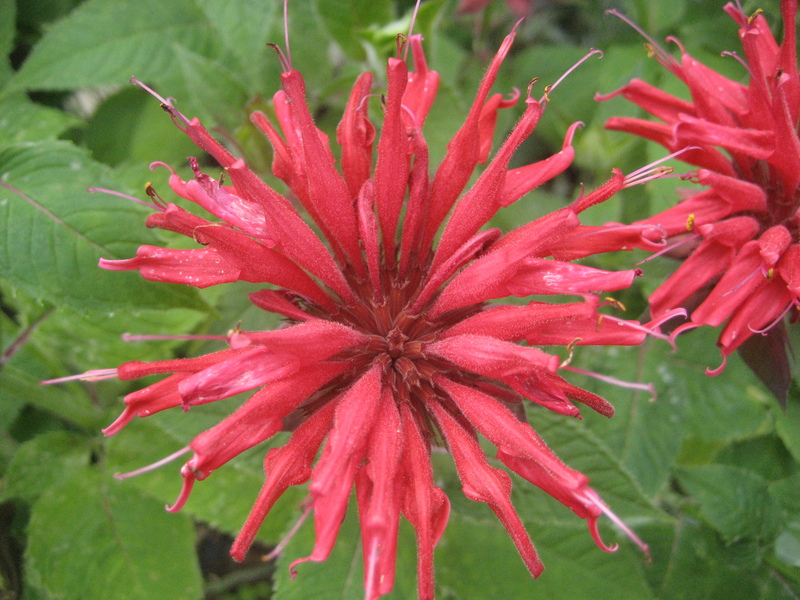 The monarda attracted the year’s first hummingbird. He joined us at dinner tonight. Bee balm? Maybe. Hummingbird balm? Definitely. 2. 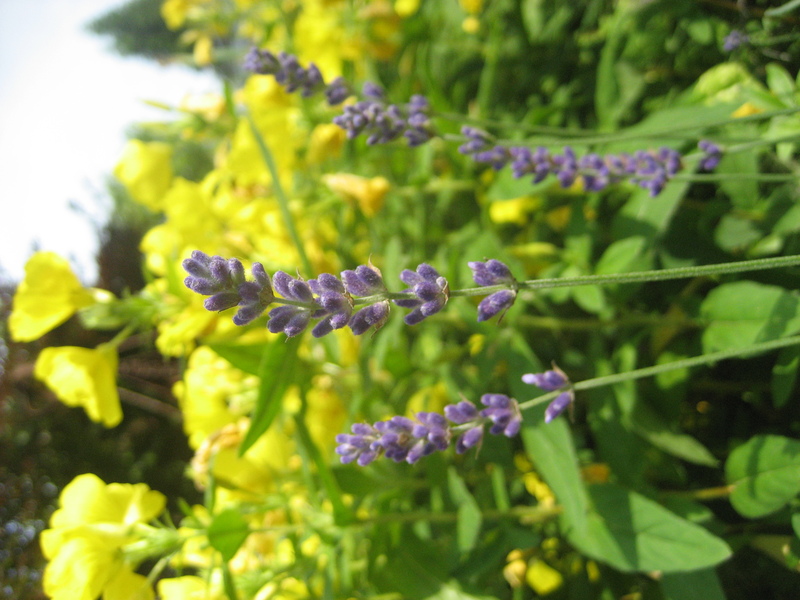 The lavender and the evening primrose bloomed simultaneously. Direct opposites on the color wheel, these complimentary beauties are textbook. 3. The salad I made to take to a friend’s this weekend called for fresh basil. I walked out the back door with a pair of scissors and had fresh basil. 4. 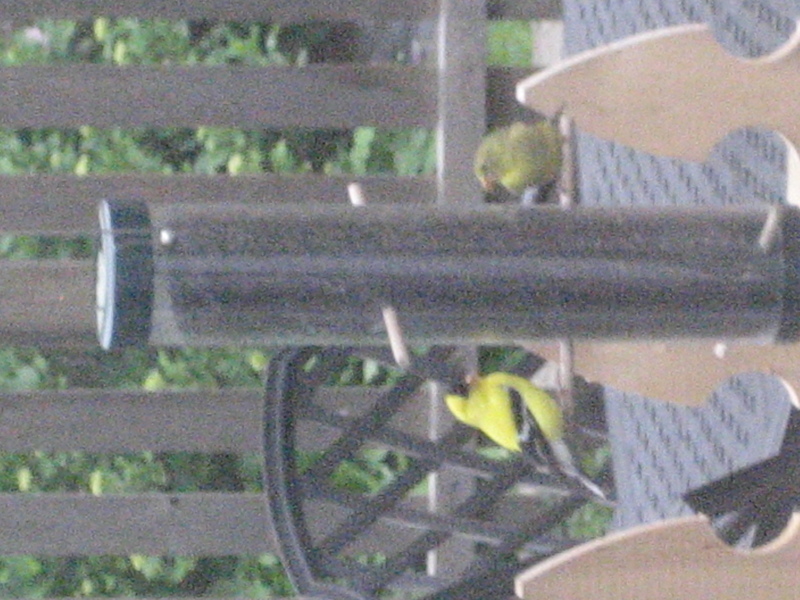 A pair of goldfinches decided to make my feeder their home. They’ve been to visit daily. 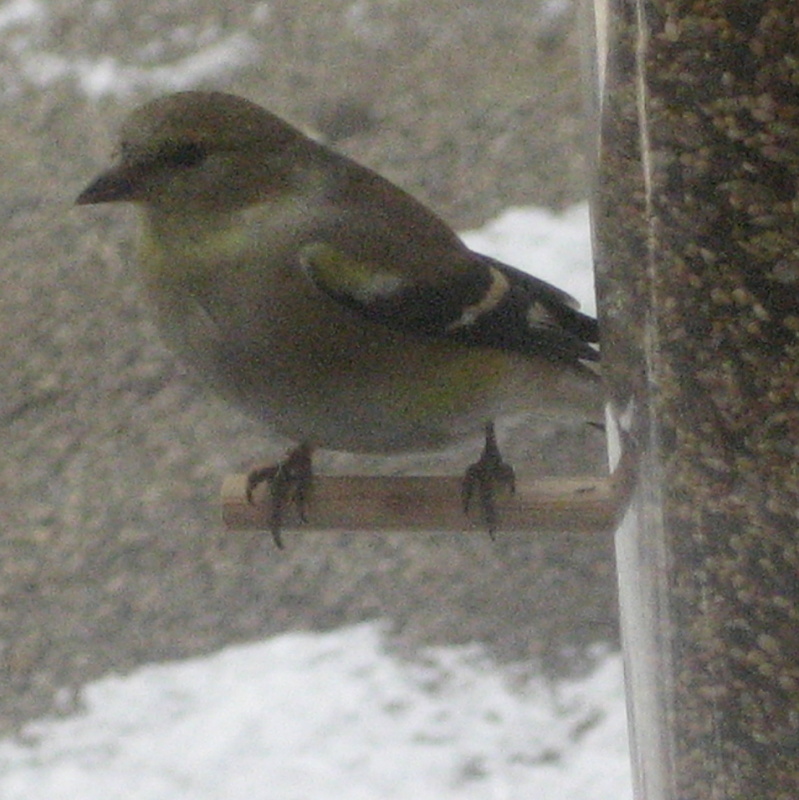 Haven’t seen these guys since they were gray and gloomy in February. 5. I weeded the whole garden today in the time in took to roast a chicken. I know my yard’s not big, but 90 minutes is definitely a record for a whole garden weed. Hot weather? Lack of rain? Excessive mulching? I don’t know what’s keeping them down, but I’m smiling about it. 7. My sticks are blooming!!! 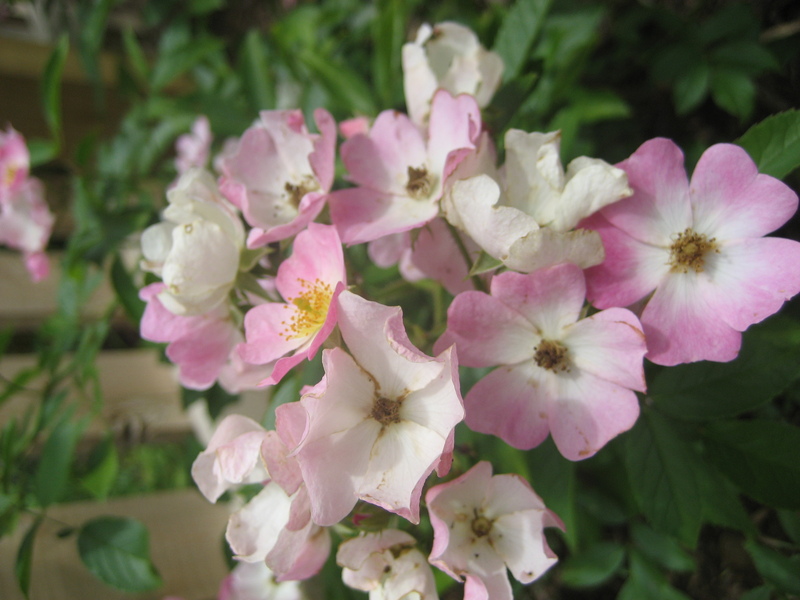 Remember the bare root roses that I put in the ground while trying to muster the faith to believe that something would actually come of them? They’re showing off now boy. 8. The jackmanii clematis that I planted last month shriveled up and died. Here’s to nurseries with guarantees! The new one is bigger and better. Whereas before I had one shoot that had made it 2 feet up the arbor, now I have three. Clearly, my garden can live without me for a few weeks. True, it is the hours I spent last month, last year, three years ago that have set it up to produce without me, but I’m loving the return on my investment. 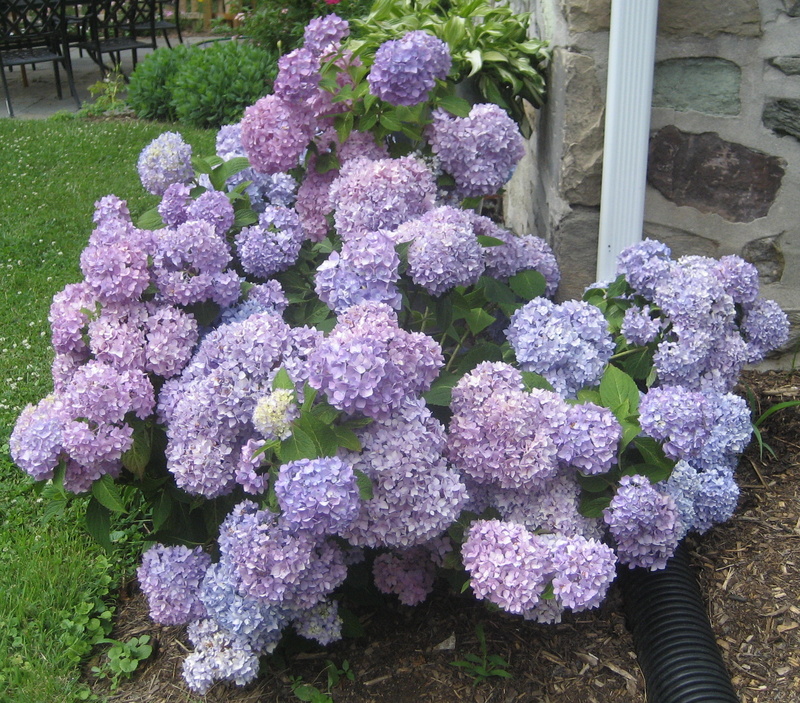 To see what’s blooming in other bloggers gardens this month, check out May Dreams Garden. I just lingered over a second cup of coffee and a back issue of National Geographic with a view of the Atlantic Ocean out the kitchen window. Life is very good here on the Outer Banks of NC. I must say, though, this award winning photo journal does make one feel a little insecure about the point-and-click garden shots one has been posting on one’s blog. Every issue of NG is gorgeous, and so exotic. Iceland, the Polynesian islands, Bhutan. Kind of makes you feel like getting off your duff and exploring the world. I guess I could explore vicariously if I buy the book advertised on the last page: “A Camera, Two Kids and A Camel: My Journal in Photographs.” Annie Griffiths, a veteran NG photographer, took her 2 kids along on most of her assignments. “They travelled to six continents and spent years in the Middle East, where the children swam in the Red Sea, explored the ancient city of Petra and, yes, befriended Bedouin and rode their camel.” Good gracious. I feel good when we make it out to throw rocks in the creek. So here I am feeling a little bit untraveled and a lot humbled in the photo journalism department, when the coolest thing happens. I go downstairs to move some laundry over and catch sight of a four legged creature strolling through the car port. A cat, maybe? Nope. A red fox. 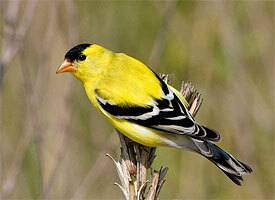 I knew they lived in the brambles around here, but I’d never had the chance to get a close look. This guy meanders around the house, nuzzles his mate who’s sunning in the back yard, and then plops himself down to catch a little sun time himself. I double back to get a better view and either they hear me or they smell me, but I get a piercing look from both of them saying, “Not one step closer lady.” Unsure if foxes are prone to pouncing on unsuspecting and barefoot gawkers, I retreat for my shoes and my camera. So I get to have a little NG moment of my own. 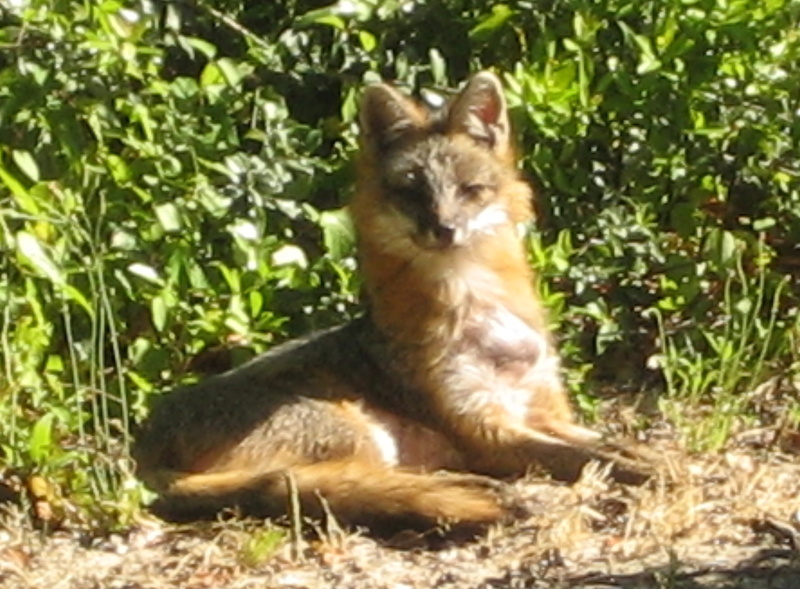 Wildlife, unexpected encounters, exoticism (foxes are exotic, don’t you think??). The photos won’t win any awards, and I doubt anyone will want to buy a coffee table books made up of them. But it was a good reminder that you don’t have to go all that far from home to have a bit of an adventure. Open eyes, a curious mind, slowing down enough to take note, and a willingness to ask what you do not know: all are key to a life filled with discovery and wonder instead of just the same old same old. 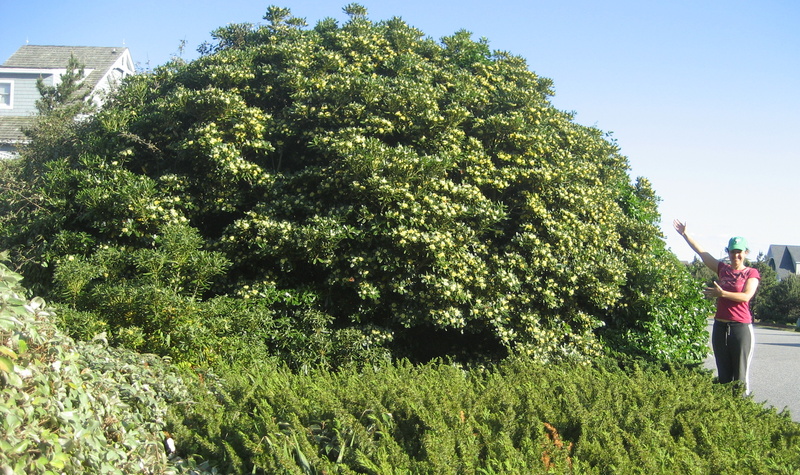 A few more things I don’t get to see in my garden in Philly: According to the lady I stopped on her walk, this fabulous shrub is a Japanese pittosporum, or mock orange. 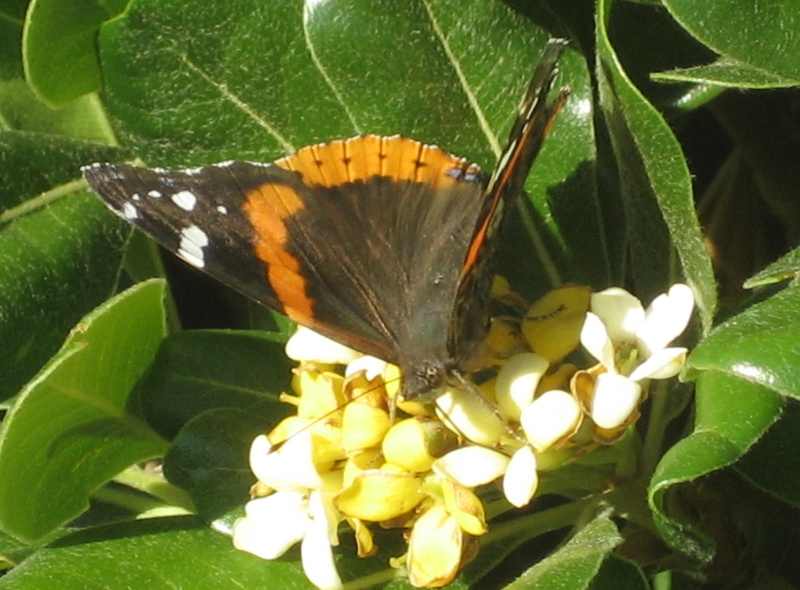 The scent has beach goers and butterflies alike weaving drunkenly among their blooms. Only grows in zones 9-10, so I might have to make do with it in a container. I guess that might be best since its 15-20 foot height and spread would BE my garden in Philly. 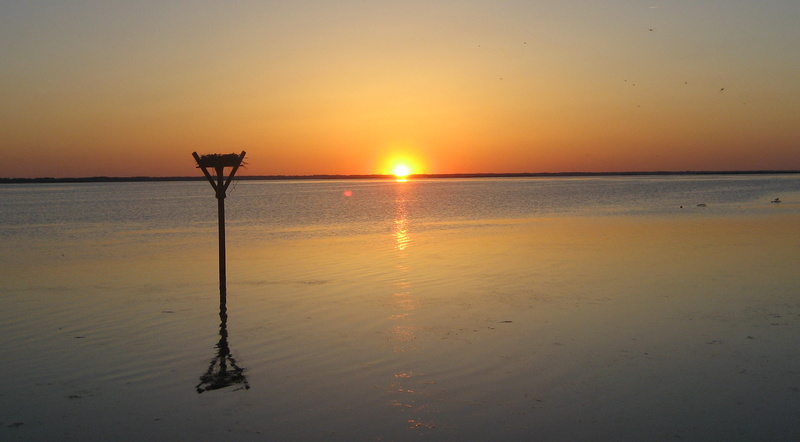 And, I got to wish the osprey in this nest good night yesterday as the sun set over the Currituck sound. The little wonders. I’ll take them. p.s. Turns out I got a few things wrong in this post. 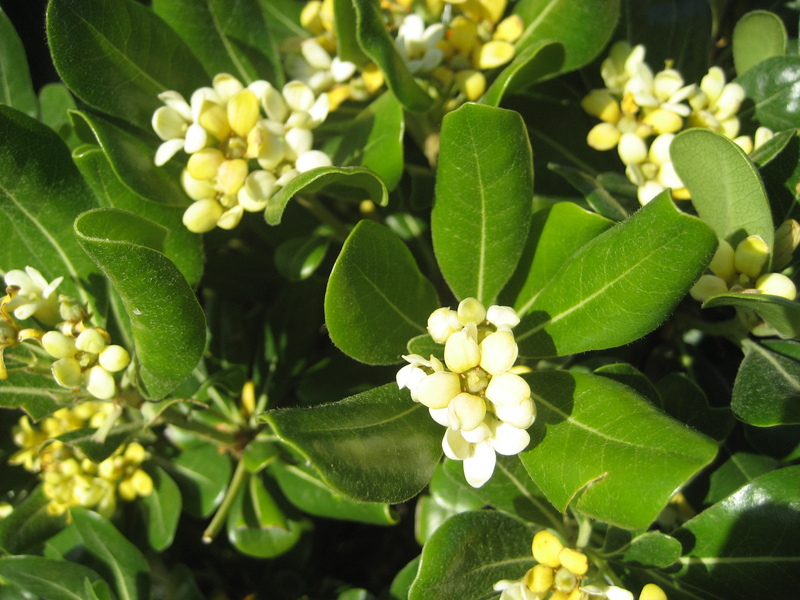 First – pittosporum is commonly known as Japanese Mock Orange. 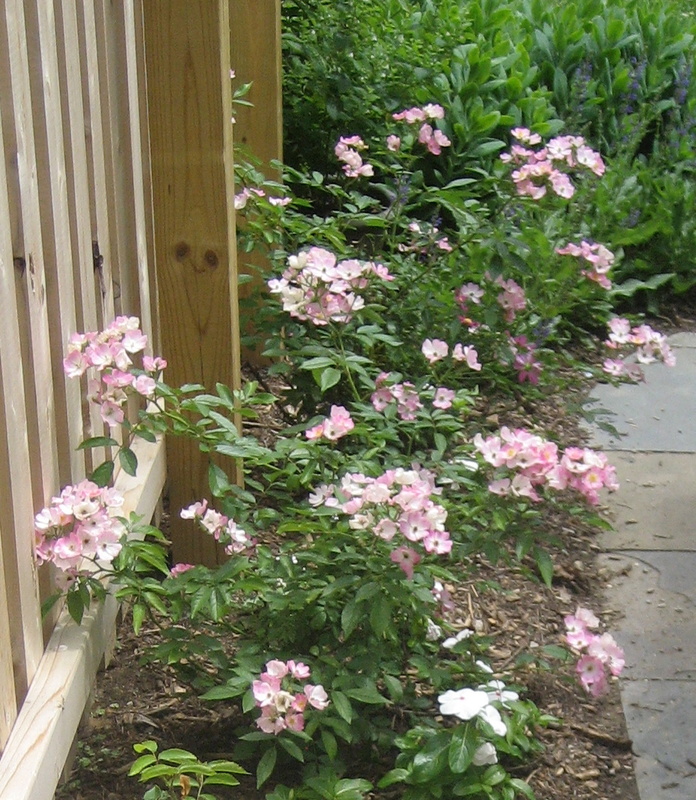 The plain old Mock Orange is native to the western US , has big white fragrant flowers is called the philadelphus lewisii. 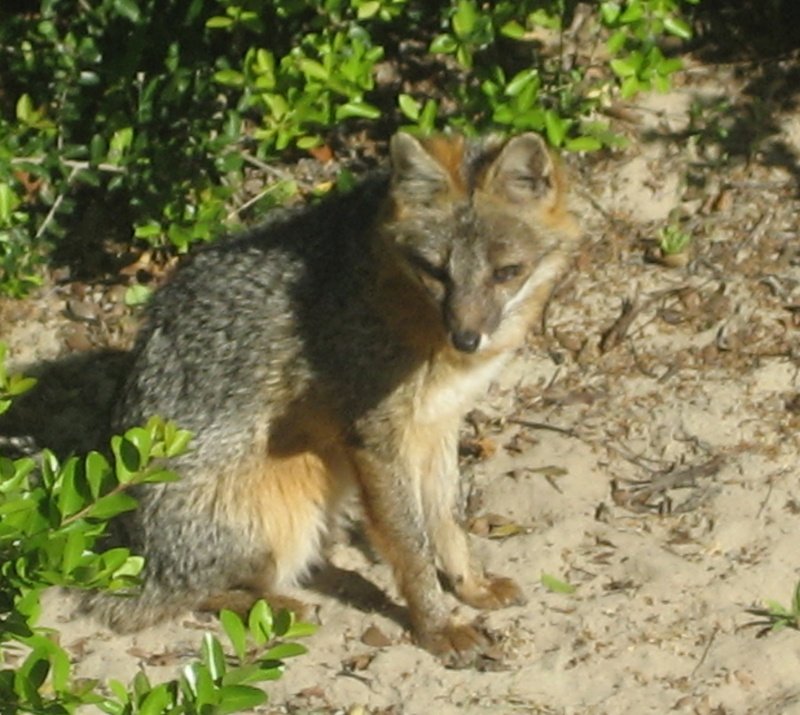 Second – those foxes are gray foxes, not red foxes. Now I know! The houses in my neighborhood are made of stone. Extravagant, you might think, until you put a spade into the ground and you wrestle out 3 Pennsylvania field stones – every time. Build with the materials on hand, right? There are benefits to having a stone house. My windowsills are a foot deep, which makes for lovely decorating space when I manage to clear them of all the kids’ school papers and library books. My house holds its temperature like a champ – when the nights are still cool in spring and early summer, the house stays 10 degrees cooler than the weather outside. My walls would withstand any huffing and puffing the big bad wolf could throw at it. So I’m excited about my new lunch companion. 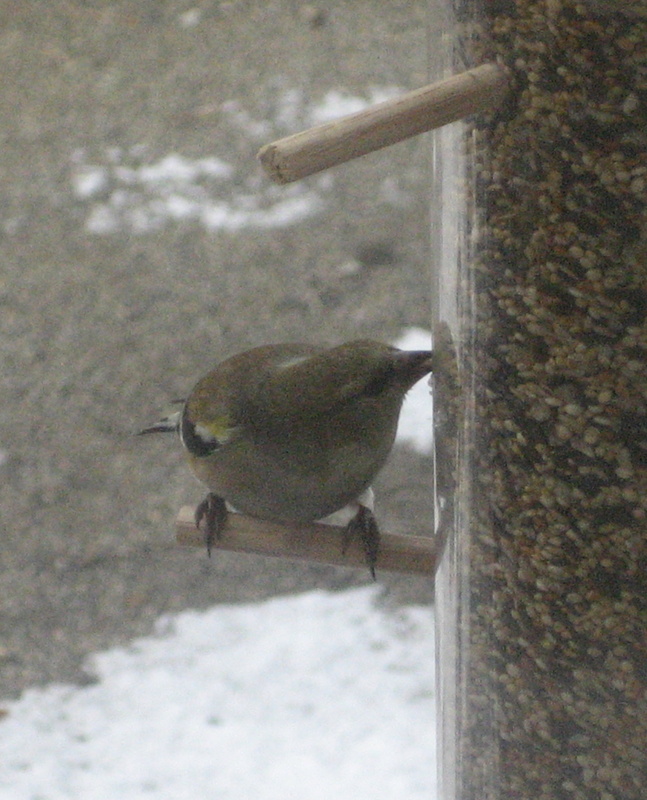 He’ll eat his seeds, I’ll eat whatever was leftover from last night’s dinner. He’ll turn yellow, I’ll turn less moody. Hallelujah, spring is coming. I garden on a tiny piece of land just outside of Philadelphia (zone 6b). My goal is to connect two of my passions: life out of doors and a good story. I keep my eyes open to the beauty around me and hope to capture it with words and my trusty Canon elph. Enjoy. On starting my fortieth year, and fall color. Cut and color, or spring bulb order? Opposites attract. Or do they? 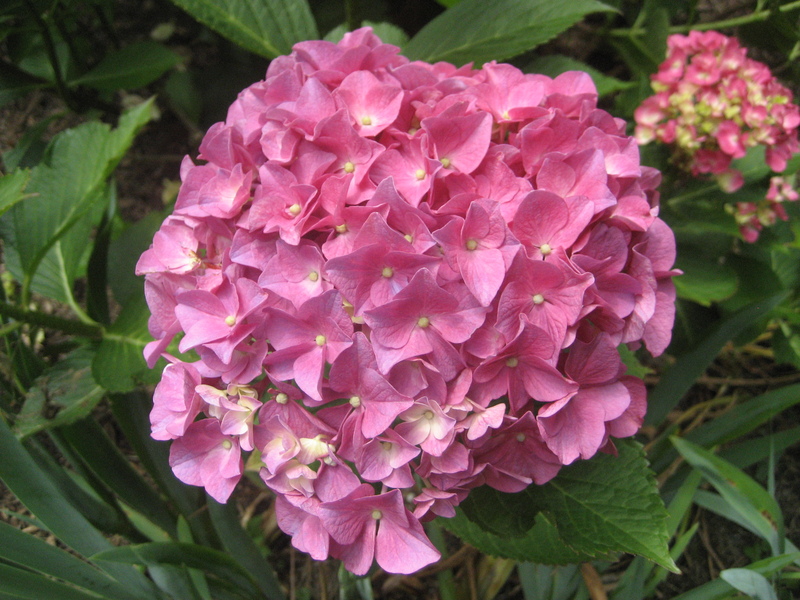 Does this make me a weed or a delightful addition to any garden?? Curious. Get e-mail notifications of new posts.